From career-ending injury to swimming with sharks in San Francisco Bay, extreme swimmer Kim Chambers is testament to the power of courage and determination. She lives by one simple rule: set big goals. In 2007 Kim Chambers slipped down the stairs in her home in San Francisco, hit her right leg and woke up in hospital the next day to be told she’d been 30 minutes from having it amputated. 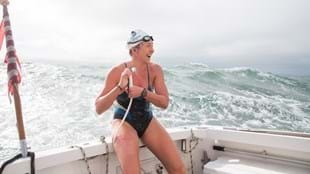 Seven years later, Chambers became the first woman to swim what is often described as the toughest swim in the world, a stretch of cold, shark-inhabited waters between the Farallone Islands, a remote outcrop off the San Francisco coast, to the Golden Gate Bridge. The 30-mile swim took 17 hours and 12 minutes and she made global headlines. Outside Magazine dubbed her “the world’s most badass swimmer”. A documentary film about the achievement, Kim Swims, will be released globally in 2018. Chambers had been physically active before being told by doctors she probably wouldn’t walk again without assistance. It turned out to be a red rag to a bull or, in this case, to a former ballerina and rower from New Zealand. It was there that she met members of the Dolphin Club, who dared her to join them for an open water swim in the San Francisco Bay. This was not for the faint-hearted; apart from the chilly temperature and the unpredictable water currents, the Bay has the highest population of sharks, mile for mile, in the world. Open water swimming has fulfilled her in a way that she had never imagined. So has marathon swimming, although it has also demanded remarkable endurance. She finished the swim in 13 hours and six minutes, and was then taken to hospital and diagnosed with pulmonary edema. She could have died. Instead she went on to swim the Farallones to Golden Gate Bridge.